drycliftdays: DCSCA-initiated Lake Lorne track now open! DCSCA-initiated Lake Lorne track now open! 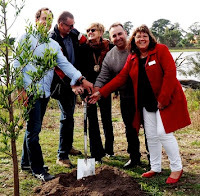 On Sunday 20 May 2016, DCSCA was represented at a small ceremony to officially open a new walking track around Drysdale's Lake Lorne. It has taken five years to create the track. The then-President of DSCSCA, Roger Lavingdale, presented the idea of the track to the City of Greater Geelong council in 2011; and the council accepted a masterplan for the project in 2012. Since then, there has been close co-operation and consultation between the council and the various community groups with a stake in the lake's future, including DCSCA, which has been involved closely throughout the project.